The elections are over and we have elected a new Governor and Lieutenant Governor and now they will be putting together the heads of departments. I wonder who will be the next Commissioner of Agriculture in Connecticut. Will the current commissioner, Steven K. Reviczky be re-appointed or will another be appointed? We’ll have to wait and see. We as Grangers need to watch and make sure the Department of Agriculture is not put into another agency. We must keep this department its own entity with its own Commissioner. We should also watch that the staff in the Dept. of Agriculture is not cut and se need the livestock and milk inspectors in the field to help the farmers. Our legislative committee will be watching and lobbying against these changes they are proposing. The new Pomona Granges seem to be well-established and are all planning meetings for December. Try to get out to your Pomona meetings and visit one of the other two Pomona meetings in our state. I have heard the attendance at our Pomona meetings have been good but could always use a few more. At the state level, the committees seem to be getting together and putting together their plans for the upcoming year. The CWA has already planned their three regional Pomona meetings for November and I hoipe they were all well attended. 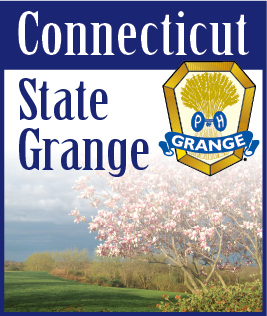 The Legislative Committee has planned to meet on December 10 at the Grange office. They will put together their legislative program. I know the agriculture committee has some new ideas for the coming year. I have added more members to the Youth Committee, they are Melissa Coleman from Riverton Grange and Jaimie Cameron from Ekonk Grange. We are also working on putting together a program for the Northeast Leadership Conference which will be held in Connecticut in 2019. We are planning on holding the conference on March 29-30 at the Holiday Inn Norwich in Norwich, CT. We will be starting at 7:00 P.M. on Friday evening and on Saturday the time will be announced. On Saturday evening there will be a banquet. We would like to have this conference open to all Grange members to attend so try to keep this date open. There will be more information on this conference in the coming months. Sharon and I just returned from the National Grange convention held in Stowe, Vermont. Sharon and I were busy working on committees and attending the sessions. Sharon was on the Education and Health Committee and I served on the Conservation Committee working on resolutions that were brought up on the floor during the session. We will have more about the National Convention in next month’s issue of the Granger. Sharon and I would like to wish all our Brothers and Sisters a safe and happy holiday season and a Happy New Year to all our members and friends.